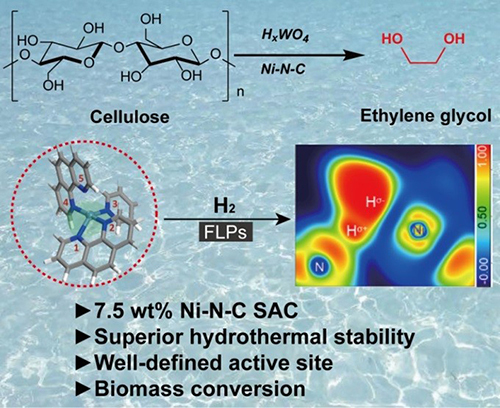 A research team led by Prof. WANG Aiqin and Prof. ZHANG Tao in Dalian Institute of Chemical Physics (DICP) of the Chinese Academy of Sciences constructed a high-loading Ni-N-C single-atom catalyst (SAC) and applied it to the one-pot cellulose conversion to important polyols (ethylene glycol and acetol). Their findings were published online in Angew. Chem., Int. Ed. and was selected as “hot paper”. Biomass, which is the most abundant renewable carbon source on the earth, is regarded as an alternative feedstock for the production of fuels and chemicals. However, the highly functionalized feature of biomass molecules necessitates the chemical transformations in liquid phase and often at harsh reaction conditions, such as strong acid/basic media, high temperature and pressures. Nickel catalysts are usually highly active in the hydrogen-involved biomass conversion reactions. Unfortunately, the vulnerability of nickel catalysts unable to survive under acidic reaction media, which is a vast barrier for practical applications in biomass transformation. Therefore, it is desired to develop a robust and acid-resistant Ni catalyst for hydrogen-assisted biomass valorizations. Recently, M-N-C (M refers to transition metals typically like Fe, Co, Ni) SACs showed promising performances in various electrochemical reactions and organic synthesis. Benefited from the strong covalent chemical bonding between M and surrounding N atoms, M-N-C SACs might be resistant against acid leaching and heat-induced aggregation. Scientists reported a high-loading Ni-N-C SAC (Ni content up to 7.5 wt%) and applied it to the one-pot cellulose conversion to important polyols (ethylene glycol and acetol). In contrast to the poor stability of Ni NPs (Nanoparticles) supported on active carbon (Ni/AC), the Ni-N-C SAC exhibits unprecedentedly durability under very harsh reaction conditions (245°C, 60 bar H2, presence of tungstic acid in hot water) and it can be reused for at least 7 times without any deactivation or single atom aggregation.